There are several excellent books that should be a part of every political junkies library. The most obvious, 1984 and Brave New World, are so poignant because they are written in very simple, concise terms. These books were (are?) consistently taught in High Schools all across America. Yet, how are the kids to understand these books in terms of reality if they are not taught the truth about History? That, of course, is another subject. It is only later, as we gain knowledge about the New World Order, as we understand that the globalists’ fascist dreams are being realized, that we can begin to comprehend the logic behind these books. They are nothing short of adroit observation, which led to almost prophetic treatises. This author has also summarized another great work, Franz Kafka’s “The Trial.” In this article, Ayn Rand’s book, the classic manuscript “Anthem”, will be discussed. It is a beginner’s guide to understanding the complete flaw that is collectivism. Conversely, this book extols the virtue of individualism, and love. We meet Equality 7-2521, the hero of the story, in chapter one. He is writing, which we discover is a sin in this future society. In fact, being alone is a sin, and everyone lives for the community. There is one night a year for procreation, so that all the kids can be born and taught together. Uniqueness is looked down upon. From “Anthem”, the society’s philosophy is a mantra spoken by each child every night. We discover that our protagonist is different. “All men are good and wise. It is only we, Equality 7-2521, we alone who were born with a curse…” Two things you will notice. One, we are not specifically told what Equality 7-2521’s curse actually is. We know that his need to be alone, to experiment, to try new things: these are what are considered sins. Second, always, even while speaking in the 1st person, “we” is used. For this alone - writing a whole book without utilizing first person pronouns - Ayn Rand deserves great literary credit. Even more so because the concept of only a “we” is hauntingly innovative. The book was written in 1937. This is our premise, that society is based upon the collective. In “Anthem”, there is only the collective. Of course, we soon discover that there are Scholars, and leaders - a proletariat - that governs this great commune. They are the law. Our hero discovers a tunnel with scientific apparatus from before the “Great Rebirth.” This is his great curse, pursuing science alone. Also, Equality 7-2521 sees a woman, Liberty 5-3000, whom he becomes attached to, even though love or coveting a woman is a great sin. The night of procreation must suffice, along with the bliss of living in the collective. This is the early climax of the story. Equality 7-2521 can either accept the dogma of collectivism or go into exile in the Uncharted Forest. He chooses to flee. I must note that one act was punished by death in Equality’s society. This act was to speak one word, but none knew it, save the Scholars. Liberty 5-3000 follows the next day, enters the Uncharted Forest, and finds her love. For the first time, they are alone. A point: although Rand espouses the virtue of individualism in “Anthem”, she subtly, correctly gives importance to the partner, the mate, the wife or husband. Equality 7-2521 is happy alone. He is happier with Liberty 5-3000. Is this not the case with most men and women? Finally, Prometheus warns of a new war against collectivism. “I guard my treasure: my thought, my will, my freedom. And the greatest of these is freedom…I owe nothing to my brothers, nor do I gather debts from them…I am neither friend nor foe to my brothers, but such as each of them shall deserve of me. And to earn my love, my brothers must do more than to have been born…For the word “WE” must never be spoken, save by one’s choice.” Rand speaks of charity instead of welfare. She speaks of respect rather than trust. The concepts that Ayn Rand holds dear no longer have a place, show not their presence, in America today. Finally, Ayn Rand gives her own personal battle cry. “Anthem” can be read in one day. Yet, the concept is eternal. She is simple, poetic, intelligent, and most importantly, Rand is correct in her analysis of collectivism versus individualism. In closing, she writes the following. Ayn Rand speaks freedom and defines individual liberty. 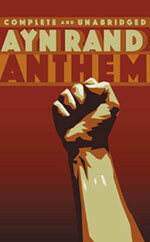 Ayn Rand’s beautiful book, “Anthem”, should be a part of YOUR growing patriot library. Will YOU break the chains when Rand and I come to raze the cities of the enslaved?